ROME—Italian Interior Minister Matteo Salvini said on March 19 he wouldn’t let an Italian-flagged charity ship disembark 49 Africans rescued in the Mediterranean Sea, setting up a fresh confrontation with humanitarian groups over migration. The Mare Jonio picked up the migrants, including 12 minors, on March 18 after their rubber boat began to sink in the central Mediterranean, some 42 miles off the coast of Libya. The vessel headed for the nearby Italian island of Lampedusa, but wasn’t granted permission to dock and is currently sailing close to land, awaiting further instructions. Salvini, who heads the anti-immigrant League party, has told non-governmental organizations that Italy’s ports are closed to them, accusing them of playing into the hands of human traffickers—which they have denied. “Italy must not give in to blackmail by a ship run by the social centers,” Salvini said on Twitter, referring to left-wing groups that have helped finance the Mare Jonio. The collective that organized the sea rescue, “Mediterranea,” said it had operated in accordance with international human rights and maritime law. “Italy must indicate a safe haven,” it said in a statement. New arrivals to Italy have plummeted since Salvini took office last June, with just 348 migrants coming so far this year, according to official data, down 94 percent from the same period in 2018 and down 98 percent on 2017. 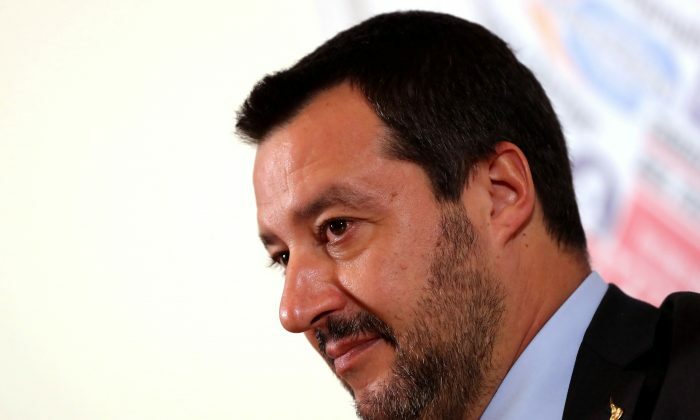 Salvini’s closed-port policy has helped support for his League party double since March 2018 elections, with Italians backing his uncompromising stance after almost 650,000 migrants came to Italy from North Africa between 2014 and early 2018. Earlier this year, Salvini kept a Dutch-flagged vessel, run by a German charity, at sea for more than two weeks with nearly 50 migrants aboard, before neighboring Malta agreed to let the ship disembark there.